4.1 out of 5 based on 35 bloggers and 1 commenters. 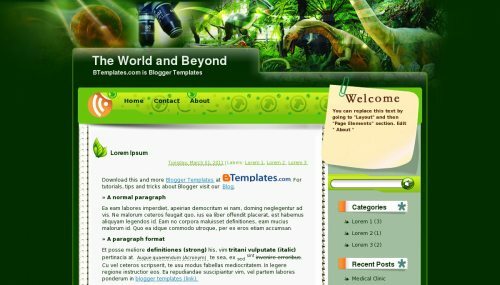 The World and Beyond is a free blogger template adapted from WordPress with 2 columns, right sidebar and rounded corners. Excellent template for blogs about animals, education or science. Menu is can not appear in this template after instal to my blog.. can you help me? how to show menu in header.